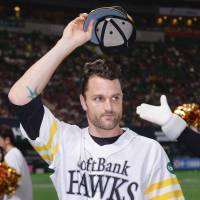 Fukuoka Softbank Hawks closer Dennis Sarfate joined an impressive club with a strikeout of Ikuhiro Kiyota on Monday night. 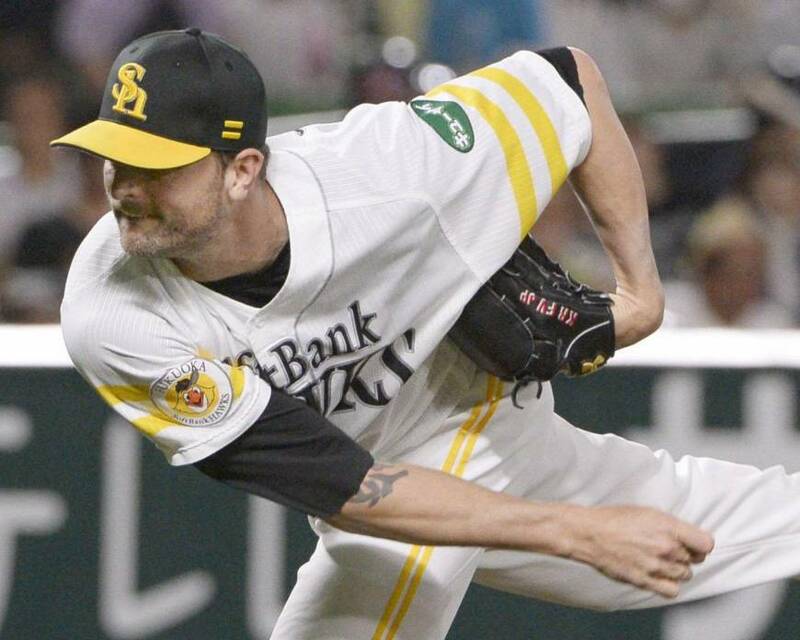 Sarfate’s strikeout closed out Softbank’s 5-4 win over the Chiba Lotte Marines, giving him his ninth save of the season and, more importantly, the 100th save of his career in Japan. Sarfate was humble during the postgame hero interview, saying going from 99 to 100 didn’t change much for him. “I’m just fortunate enough that God’s given me the ability that he’s given me, and I’m fortunate enough to have such a great team,” Sarfate said. The 34-year-old right-hander is the 26th player in NPB history to convert at least 100 saves. He’s currently sixth among active players in saves and is also the sixth foreign player to reach triple digits. Marc Kroon, a hard-throwing right-hander, has the most career saves by a foreign player with 177. 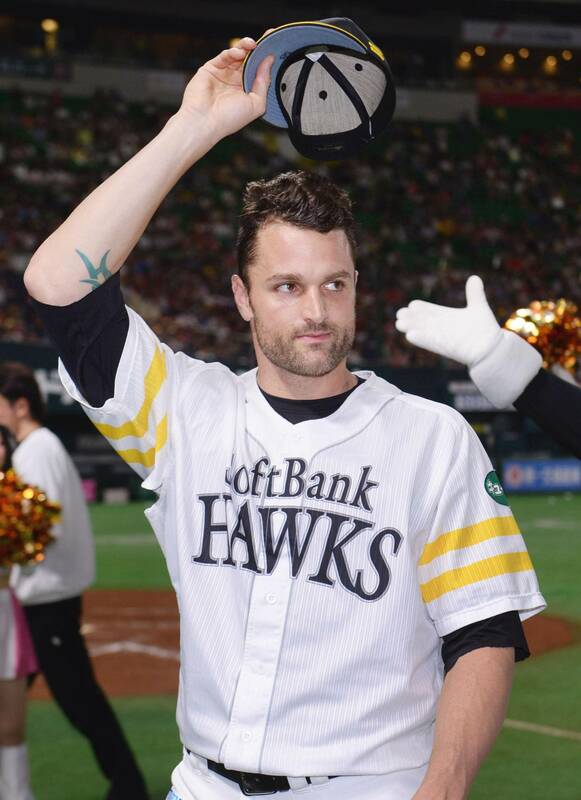 Sarfate is in his fifth season in Japan, having previously spent two years pitching for the Hiroshima Carp and one with the Seibu Lions before joining the Hawks. Sarfate was a solid contributor in his previous two stops but has really been on top of his game since joining the Hawks last season. The right-hander made 64 appearances for the Pacific League champions during the regular season, racking up 37 saves and striking out 96 while allowing eight earned runs in 68 1/3 innings without yielding a home run. 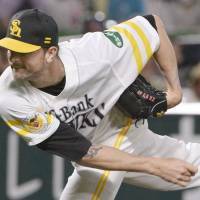 He also played a key role out of the bullpen against the Hanshin Tigers during the Japan Series, finishing with a win and a pair of saves as Softbank won in five games. He’s picked up where he left off early this season. Sarfate was 2-0 with nine saves in 15 appearances for the Hawks in 2015 entering Tuesday’s games. He had struck out 19 and had yet to allow a run in 15 2/3 innings. Lead by example: Chunichi Dragons player-manager Motonobu Tanishige took Hanshin Tigers starter Randy Messenger deep in the fourth inning of the Dragons’ 9-2 win on Monday afternoon. Tanishige, who began his career with the Yokohama Taiyo Whales in 1989, has now hit at least one home run in 27 consecutive seasons, an NPB record. The 44-year-old also showed off rare effectiveness at the plate on Monday, finishing 4-for-4 with the aforementioned home run and a double. It was Tanishige’s first four-hit game since Sept. 3, 2010. Tanishige has played 3,002 games in his long career and is approaching Katsuya Nomura’s all-time mark of 3,017. Nomura and Tanishige are the only players in history to appear in at least 3,000 NPB games. Sadaharu Oh is third all-time with 2,831. Out of the woods: Seibu Lions second-year player Tomoya Mori was taken in the 2013 draft with a reputation for being a player who could be a force at the plate. He’s beginning to show why just a little over a month into this season. Mori had appeared in 29 games for the Lions through Monday and was hitting .314 with five home runs (tied for fourth in the Pacific League) and 17 RBIs. Playing alongside the slugging duo of Takeya Nakamura and Ernesto Mejia, Mori (just 19) is probably only going to get better as he moves further along in his development. A scary proposition for PL pitchers. Mori is the latest in the line of hard-hitting players drafted out of Osaka Toin High School, a group that includes Nakamura and the Hokkaido Nippon Ham Fighters’ Sho Nakata, who currently leads the PL with 10 home runs.